The front exterior of your home – the driveway, front yard, verandah and entrance – is a fantastic place to start making that all-important first impression on house guests. Even mailboxes and house numbers can have a wonderful way of grabbing people’s attention. The architectural design should reflect the overall style of your house and the family that live there; while your choice of materials will help your house blend in with its surrounds. Browse the photos on Houzz for ideas and inspiration for the exterior of your house, and strike up a conversation with the architects and designers of your favourite picks. You’ll find house designs for contemporary, eclectic, modern, traditional styles and more. How do I decide on the exterior style of my home? Your location, overall sense of style, budget and current home layout will dictate the style of your exterior. If you’re renovating a period home, the materials and features you use should reflect the date in which it was built, while a unique colour scheme could add contemporary flair. New homes may prefer to look to modern or contemporary designs with structural simplicity, whereas, if you live by the ocean, a beach-style design may better suit your locale. That’s not to say you can’t build a new home that has period influences. If you’re a traditionalist, you can borrow architectural details from the Art Deco period, for instance, or use finishes that reflect more of a Scandinavian style, too. What exterior house colours and materials should I use? 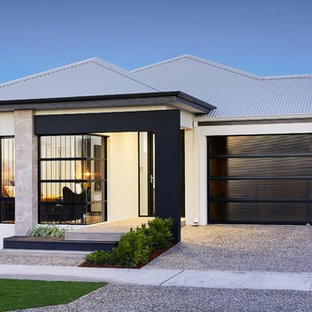 Traditional homes typically use brick and timber building materials, while stone, board-formed concrete and metal cladding are popular contemporary options. Again, the materials you use will depend on your location and the statement you want to make. Your budget will also affect your choice. Vinyl siding is affordable and easy to install, while stone is more expensive but durable and low maintenance. If you’re not ready to renovate but want to update the exterior of your home, you can still paint it. Look to your neighbours when choosing exterior house colours. Consider the streetscape and what type of colours are already in use, firstly, so you don’t replicate next door’s shade; and secondly, so you don’t stand out like a sore thumb. If you’re renovating a period home, you could paint features or intricate details in a bold, standout hue. Front doors, garage doors and window trims also look great in eye-catching colours, even if the rest of the house’s facade is neutral. How can I maximise my home’s street appeal? To spice up your home’s architectural design, landscape the surrounding area with plants and pathways that accent the style of your home. If you just need a quick revamp, look at your cement and pavers – these can split and crack over time; and repairing or replacing them can do wonders for your street appeal, especially if it’s a large area like your driveway. Plants, garden paths or low walls can can also add structure to your front yard. Light up your home with sufficient outdoor lighting to make walking up to the front door easy at night. You could use bollard lights along your entry path, or replace tiny wall sconces with statement pendant lighting at the entrance or on your verandah. Decorative elements such as house numbers, mailboxes and doormats will also add character. And if you're looking to sell your house, it may be worth hiring a stylist to help make the most of your property. 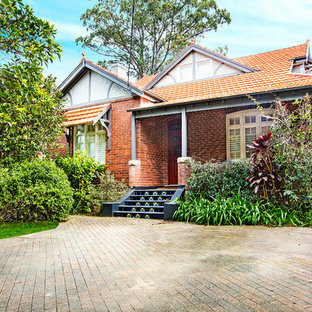 Mid-sized victorian one-storey white exterior in Sydney with wood siding and a gable roof. Design ideas for a traditional two-storey grey exterior in Melbourne with wood siding and a gable roof. 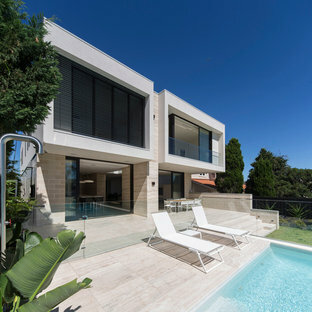 Photo of a contemporary exterior in Perth. Large beach style two-storey beige exterior in Brisbane with wood siding and a gable roof. 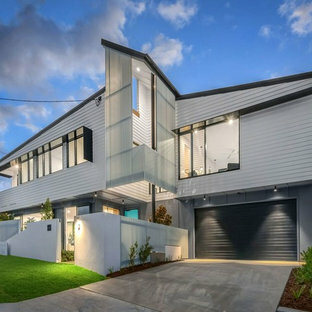 Photo of a contemporary two-storey stucco white exterior in Melbourne with a flat roof. Beach style one-storey stucco white exterior in Perth with a hip roof. 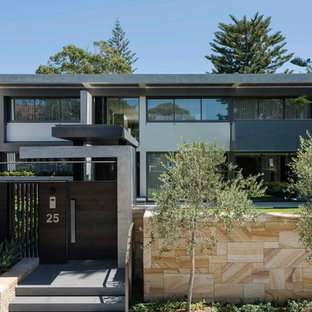 Inspiration for a contemporary two-storey exterior in Perth with a flat roof. 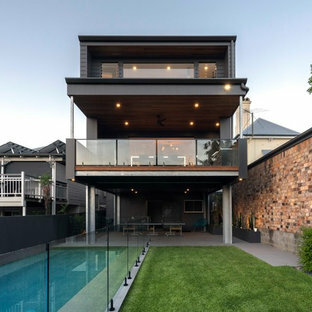 Inspiration for a contemporary two-storey black exterior in Perth with mixed siding and a flat roof. Inspiration for a beach style one-storey brick blue exterior in Sunshine Coast with a gable roof. Beginning upstairs, non symmetrical sliding doors, large fixed panel and smaller door, opening onto front balcony. On ground solid timber door with timber strip cladding, with aluminium frame with double side light. 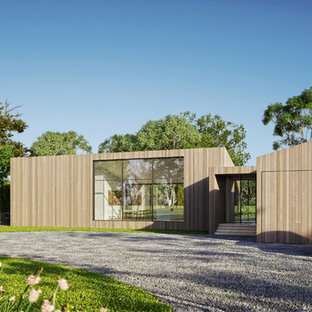 Large contemporary two-storey brown exterior in Melbourne with mixed siding and a flat roof. 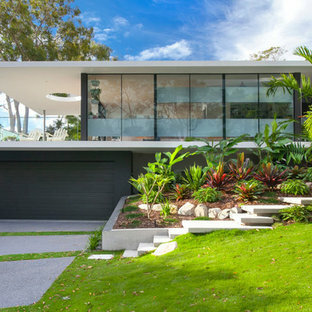 Design ideas for a large contemporary two-storey white exterior in Perth with a flat roof and mixed siding. 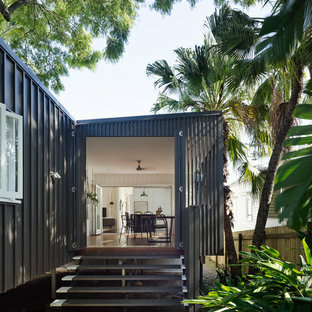 Beach style two-storey grey exterior in Sydney with a gable roof.